Err But They Look Identical I Hear You Say? Just when we thought the counterfeit NGK Spark Plugs we found recently were a pretty close match to the real thing, we’ve now found counterfeit Denso Iridium Power Spark Plugs as well. 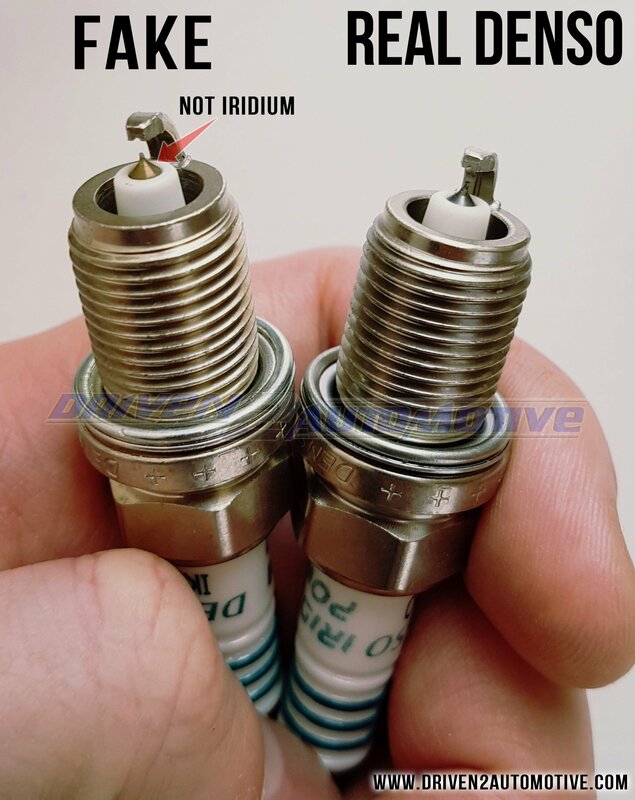 Every detail has been cloned to the closest result possible, except for one main flaw; these plugs don’t feature any Iridium at all. Alarm Bell 1: No laser-welded Iridium tip, features a machined down nickel alloy tip instead. Alarm Bell 2: Low-resolution, scanned copy of the box. 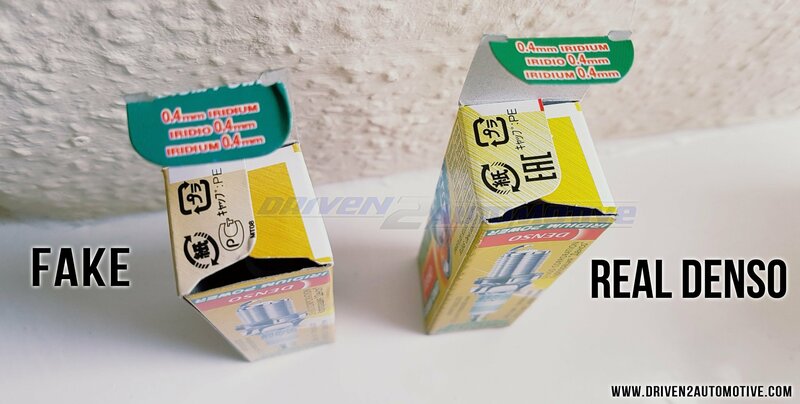 Alarm bell 3: Major blooper – EAN of the 4pc outer plug box is stamped onto the 1pc inner boxes. Below: The same EAN barcode for a 4 quantity plug box has been printed on all of the 1x plug boxes inside, which is completely wrong. 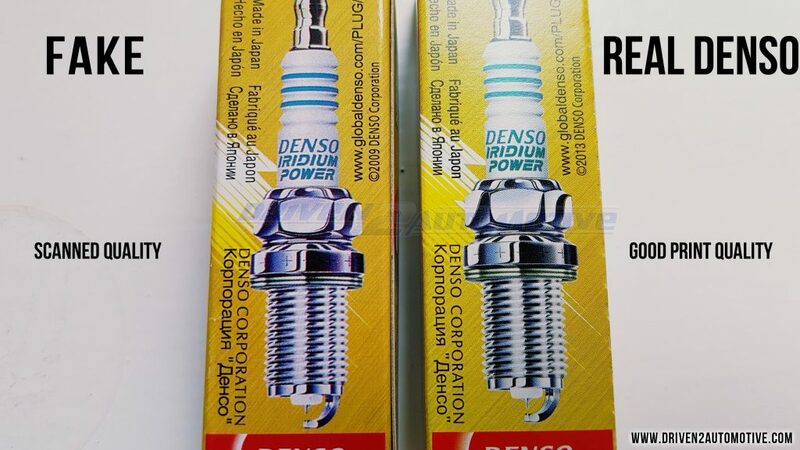 Real Denso plugs use a different EAN for a 4pc box and 1pc box. 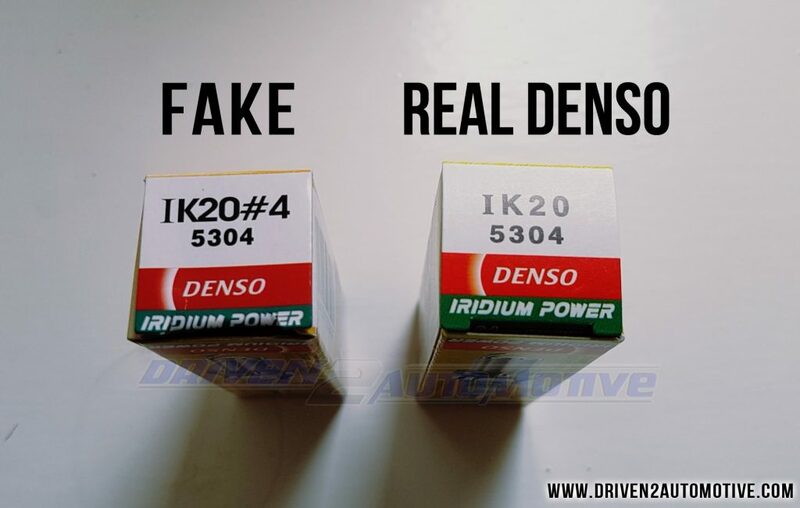 Notice how sharp the real Denso box printing is? Below: Another telltale sign is the print quality. It seems like a pretty decent scanner has been used, however it’s in no league compared to a print job that’s fresh from the original artwork file. 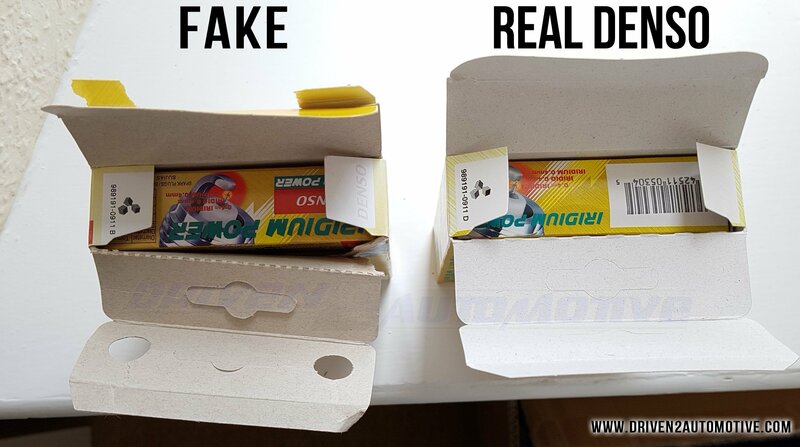 Below: The cardboard material used is a cheaper type on the fake box. Also look at the corrugated fold lines too, they have a different patterns. Below: Subtle differences again, printing sharpness, also notice that the curved edge on the thumb flap is a different shape. This is where it gets hard to tell them apart. 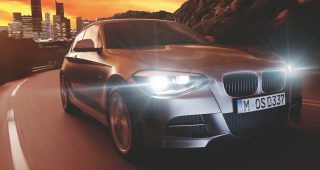 There’s no doubting that these are high quality copies, however to trained eyes and with genuine Denso’s on hand from our stock, the differences are fairly obvious. Two Below Pics: The centre electrode tip definitely don’t feature a laser welded iridium tip, they appear to be made of a nickel alloy instead which has been machined down. 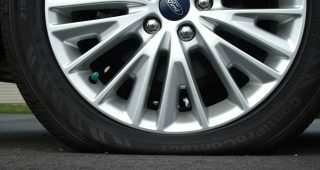 Below Pic: The crush washer is almost identical, however by looking at the centre recess you’ll notice the genuine Denso has a much deeper groove between the top and bottom rings. The metal areas around the punch letter stamping appear more swollen than the real plug also. Below Pic: Font style on the part number is very authentic looking, this is a clear sign of tracing paper being used and then transferred to Photoshop for touch up. 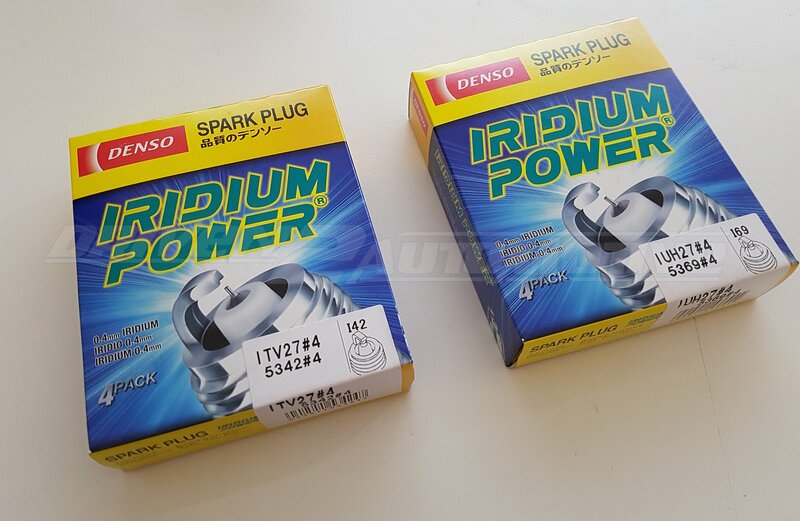 During the last month or so, Denso has gradually started phasing in a new Iridium Power packaging design. 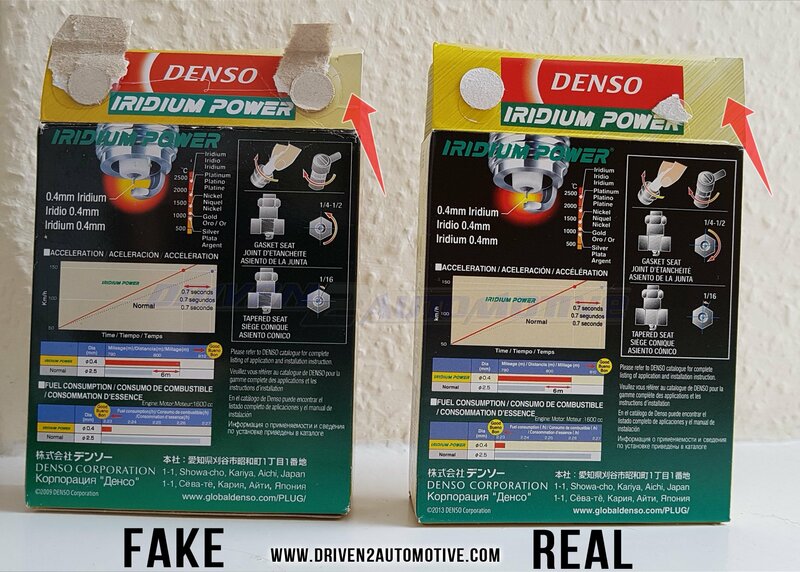 The boxes below are 100% genuine, directly from Denso. 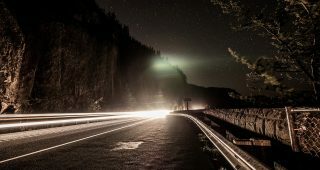 Please share this article as much as possible to make others beware! 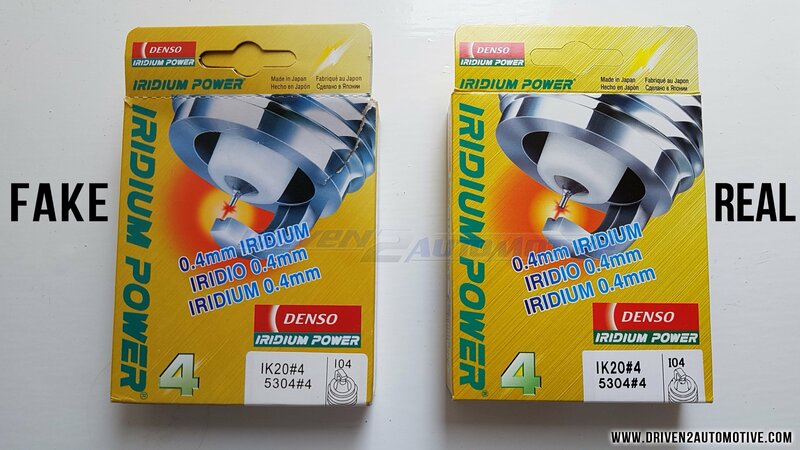 Denso iridium IK20 5304 X 6, I have just received my 6 plugs, I did the comparisons on your “how to spot a fake”. They seem to be genuine going by your pics.. & comments. Replacing my plugs on a V6 engine with 3 plugs facing the firewall is a mammoth job on my car. 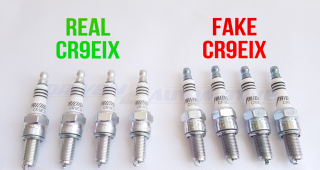 My question is… Say my plugs are fake, do you have any idea as how they will perform / last ? For an integral part, how do these people get away with this ? Glad to know the article helped! 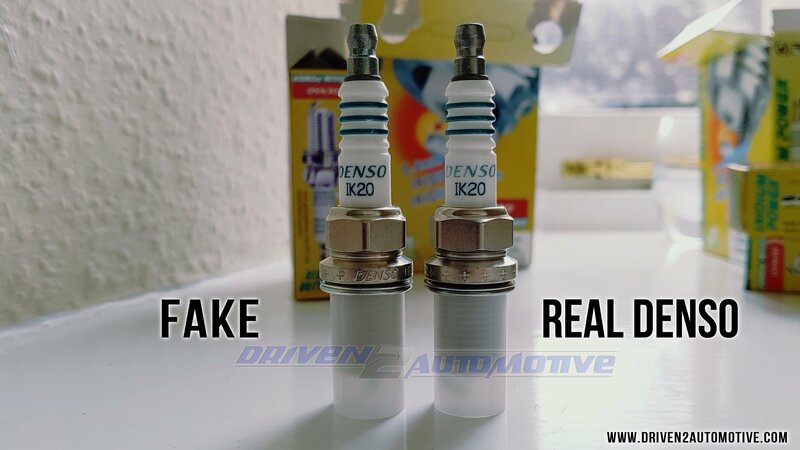 In general, fake plugs are manufactured based around their exterior appearance, so the materials used are really their downfall. 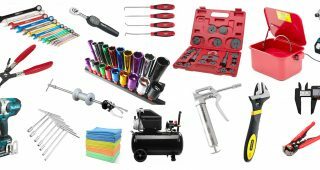 In a manner of speaking the quality of the metals used can be comparable from say stainless steel vs mild steel. 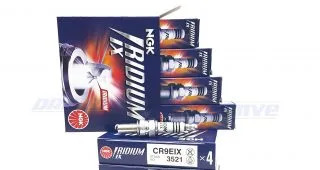 If you take a look at the fake plug in our article, you’ll see the ‘iridium’ center electrode is in fact nickel. 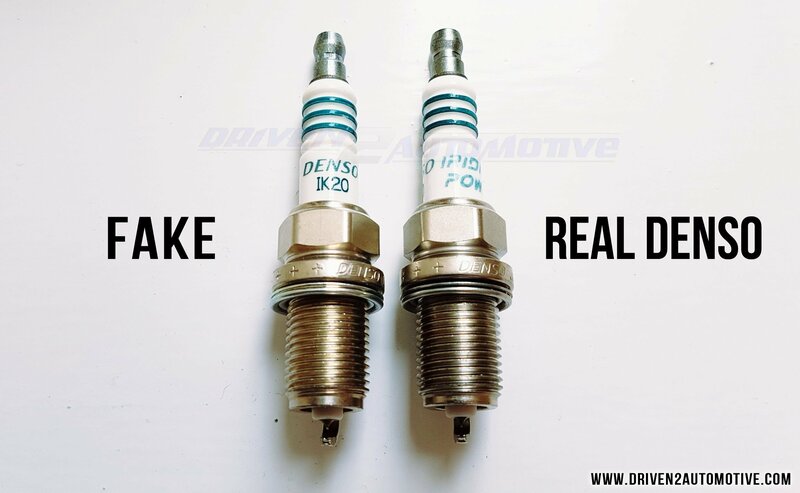 Traditional standard spark plugs feature a nickel center electrode, however they are much larger in diameter, and there’s a reason for that: Lifetime. Now reduce the diameter of that nickel electrode to a 0.7mm tip and you have a spark plug that will probably last only a couple months until the gap is too big and bad running ensumes. 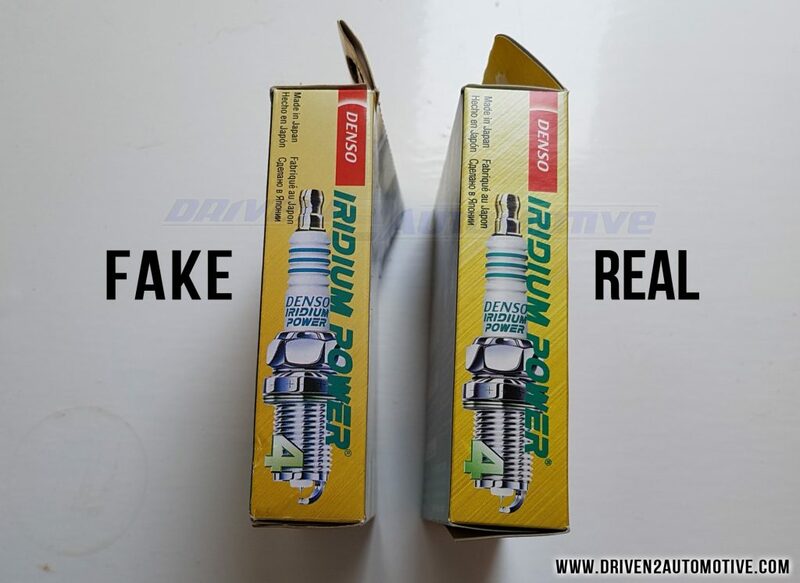 Individuals who sell fake spark plugs on marketplaces outside of the source country certainly don’t get away with it for long, as long as it’s reported accordingly (which is exactly what we do). As for the source to be taken out, the problem is that there’s no way to enforce a copyright law from one country to the other. Unfortunately for legal reasons we can’t say any more on the matter. I recently bought a set of IKH24 Iridium Power spark plugs and my box looks nothing like the one in your pictures. Should I be worried? 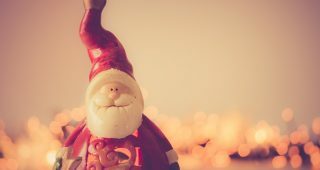 Can I send you some pictures for review? Perhaps Denso is using a new package. The printing looks high quality, but the EAN barcode looks more like your fake pictures above than the real Denso ones. No problem, please check your email to reply and send us some photos. 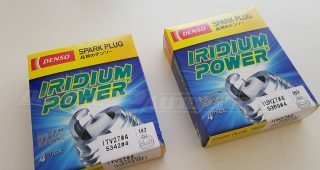 Also to note, Denso has just released new box artwork for the Iridium Power range. Have a look at this quick photo snap of our latest stock to see what they look like. 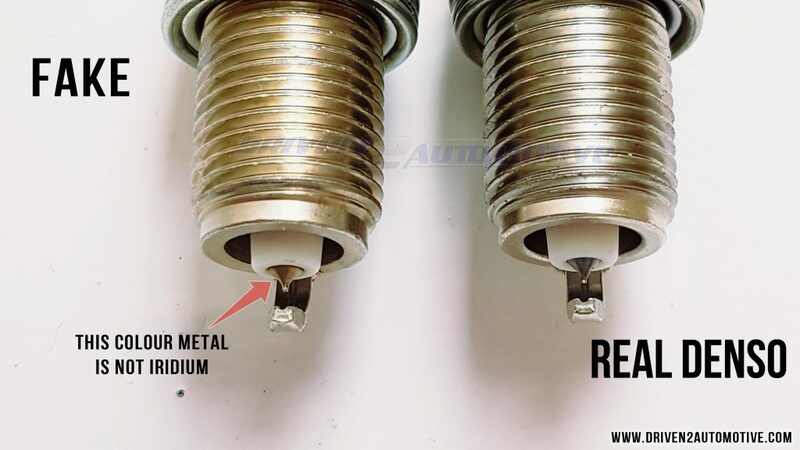 I have a VW beetle turbo …I want to know which kind of plugs it has please..
I’ve purchased item # 222926076275 on eBay do you think these are fake?